Image Phantom International. PR excerpt: "The unofficial time for the Flying Phantom recorded on the finishing line by the team was 6 hours and 21 minutes, with a “virtual” position just after Hydros.ch that finished 9th with a time of 06 h 18mins 25 s and ahead of the first M2, GSMN Genolier in 06 h 24 mins 02 s. Skipper Dona Bertarelli, Yann Guichard and the crew of Ladycat powered by Spindrift racing won this 76th with a time of 05 h 38 mins." Gurvan Bontemps & Benjamin Amiot are one of the top F18 crews in the World, and they also have by now lots of Raid & Long Distance racing hours. Doing the Bol d'Or is not an easy endeavour, finishing near some big M1 cats and in front of several M2 is even more impressive. 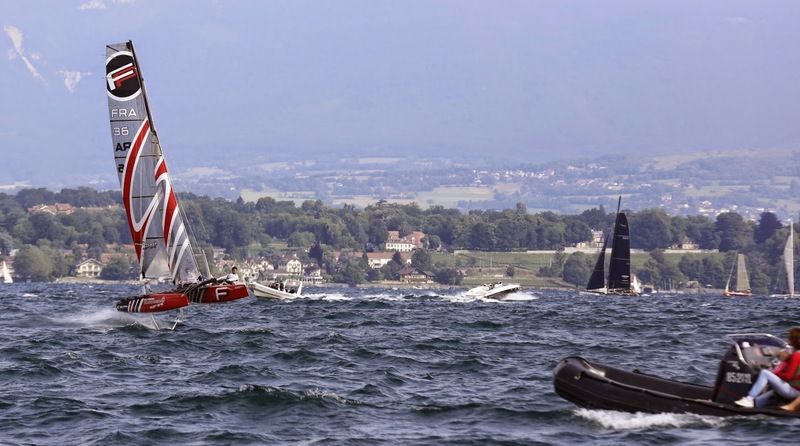 With dead calm the FP struggles as seen at Geneve-Rolle but with some decent wind the the performs as we saw at Carnac and now at the Bol d'Or. You have the tool but experienced and first class sailors like Gurvan & Ben are key. Check their comments on the experience below. The Texel is going to be quite interesting to follow. Press release FP: Flying week in Geneva: Bol d'Or & Testing sessions. From June 7th to 15th, the Phantom International team moved its operational base to the Société Nautique de Genève in Geneva to take part in the Geneva-Rolle-Geneva, to present the Flying Phantom to Swiss sailors and race around Lake Geneva with the fleet of the Bol d’Or Mirabaud. 43 sales, this week was an important milestone that provided the team with the opportunity to meet future Swiss Flying Phantom owners and organize sailing sessions with D35 catamaran sailors. and back with a total distance 123 kilometres or 66.5 nautical miles. As the Flying Phantom does not comply with any of the classes allowed to enter the race, the team decided to sail around Lake Geneva following the same racecourse and starting at the same time as the other boats competing in the Bol d’Or. This edition was a real success with more than 500 boats and 3000 sailors and was sailed in challenging conditions with strong Bise wind on the lake. The sailing sessions with the Flying Phantom started on Monday evening after the end of the Open de Versoix for the D35s with Arnaud Psarofaghis - Realteam Sailing and Jérémy Bachelin – Team Tilt. Conditions were very unstable but it was possible to fly upwind and downwind offering fantastic pictures in front of the famous fountain in Geneva. Many other sailors including Lucien Cujean and Sébastien Schneiter had the opportunity to fly during the week and were able to appreciate the foiling performance of the Flying Phantom. The Phantom International team would like to thank the Société Nautique de Genève, the Yacht club de Genève and all the Swiss sailors for their great reception and the enthusiasm they showed for the Flying Phantom. We look forward to coming back next year. The next event for the team is the Round Texel Race in the Netherlands, which is one of the biggest multihull events in the world and will be held from June 26th to 28th.